These words go to the heart of the gospel of Jesus Christ and to the soul of the Lutheran Reformation. They are linked to Luther’s key insight that helped trigger the Reformation – Christians attain salvation only by the grace of God. We call this justification by faith alone. 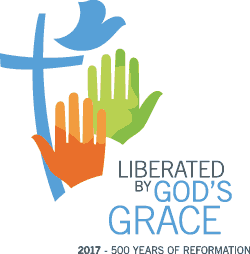 “Liberated by God’s Grace” is the main theme of our celebrations surrounding the 500th anniversary of the Reformation in 2017. It will also be the theme of the 2017 Assembly of The Lutheran World Federation in Windhoek, Namibia. All our celebrations, worship, study and engagement over the next three years will focus on how the gracious love of God, through the life and ministry of Jesus Christ, opens up opportunities for us as faithful Christians to reach out as healers and reconcilers to a world torn apart by strife and inequality. We want to engage you in dialogue. We are asking – liberated by God’s grace, from what? For what? Your response will reflect the reality of life where you live, but we believe we are called to be responsible citizens in God’s world and good steward’s of God’s creation. We are freed by the grace of God to engage in this Christian ministry. Seeing in the stranger a gifted person and ‘a gift for me’ makes dignity possible and holds others in great value. Rapidly changing climate is threatening ecosystems and societies. This is a wake-up call to critically assess consumer driven lifestyles in order to safeguard creation. The gift of salvation confronts not only the pride that assumes God’s gifts can be acquired for personal status, but also the deceiving spirit seeking such free gifts for egoistic purposes.